The Teky Team has over 60 years of technical and business experience to share with our clients. Jeff Wright has his Bachelor’s Degree in Electrical Engineering, but fell in love with the personal computer early in his career. He has experiences that have taken him around the world and had him writing software, debugging databases, and supporting both large and small systems. 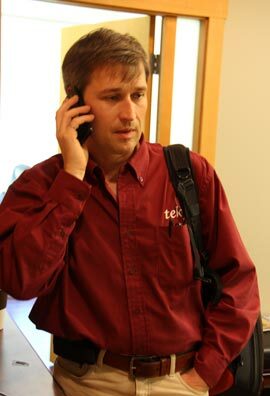 He loves the diversity and demands of onsite technical support, and his “calling” has always been to help folks with their computer issues. Sharon Goatley is a Microsoft Certified Systems Engineer and a graduate of UVic's Application and Management of Information Technologies (AMIT) Program. She has been involved in the computer industry for 30 years and currently specializes in database development, design for print and website design. Sharon's unique combination of business and project management, systems development, technical documentation and IT experience allow her to build effective solutions for our clients.